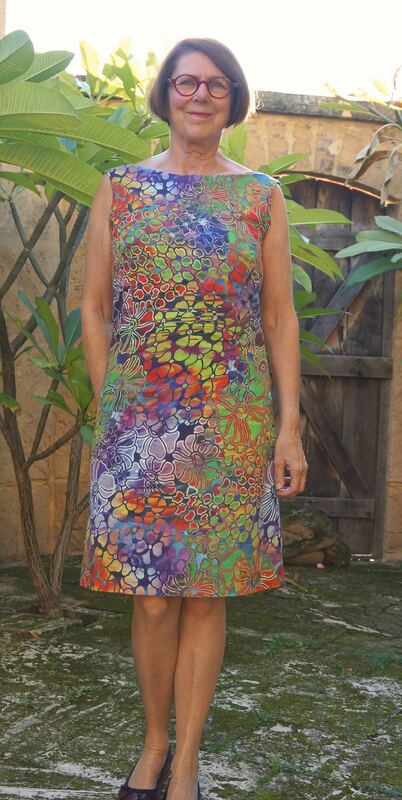 The Lilly dress: a new pattern! Hello everyone, there is a new pattern hitting screens all round the world, and it is the Lilly dress. This dress is inspired by the Lilly Pulitzer dresses that everyone but me has heard of, and was designed by the incredibly creative Deby Coles at S0 Sew Easy. the pattern is layered. I had never seen this before. What it means is that you choose your size prior to printing and only that size gets printed. Need to grade between sizes? No problem, just print the sizes you need and do your grading. 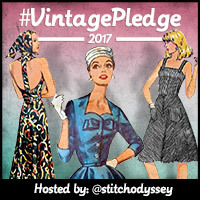 There is a quick checklist for more experienced sewists, so they don’t have to wade through all the (for them) irrelevant detail. Tricky components of the construction are supported by tutorials. Although I made my dress in the middle of winter, I have been able to wear it with the addition of one of my Jenna Cardis on some of our slightly warmer days. This is the kind of basic shift pattern that is a must in any wardrobe. The opportunities for hacking the pattern are endless. Change the neckline, add darts at the front to give a bit more shaping, make it from a thick ponte knit for a winter option, add sleeves, add pockets, and so on. I added front darts to add shaping as I looked a little second trimester without it. I decided to quickly make a ponte version to wear in the cooler weather. I wanted pockets on this one, but didn’t want them inseam, so using a compass I drew a semi-circle, added some straight lines and hey presto, I had pockets. It all looked a bit plain, so I cut a couple of strips of bias and used Sashiko techniques (after a fashion) to stitch the binding to the top of the pockets. I made my binding slightly longer than the width of the pockets so that I got a gathered effect. I then Sashiko sewed around the edge of the pockets. They are not perfect, but I’m ok with them. 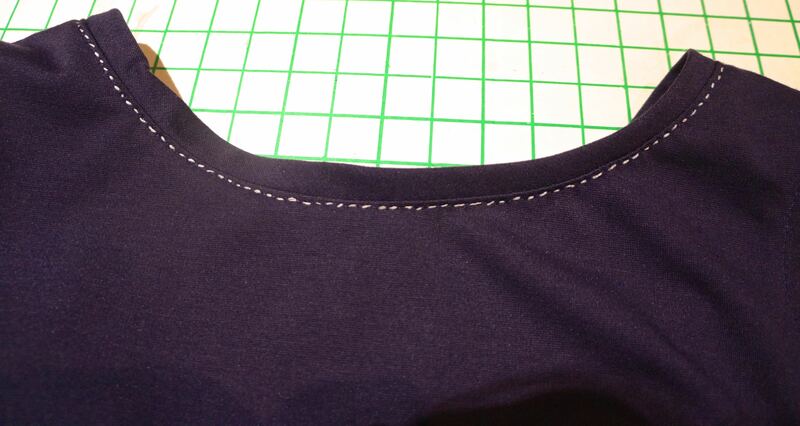 I consulted with Megan from Meggipeg and she suggested that I put stitching round the neckline too. So I’ve now done that. She’s right, it helps. I didn’t use a zip or line this version. Without the lining I needed to finish off the neckline and armholes, so I managed to scrape a few scraps of bias from the leftover fabric and did a regular binding (I have no fabric left from this one, which is wonderful). Details: Pattern is the Lilly Shift Dress just released from So Sew Easy (pattern here). My first one is made from a cotton remnant from Potter Textiles that I’ve had in my stash for years. I lined it with some blue lining also from my stash. The second one is made from a mid-weight ponte remnant that I may have bought at Pitt Trading. The cardigan is my purple Jenna, blogged here. I LOVE that print!, claps me gleefully! I love all things Lilly Pulitzer! I hadn’t yet heard of this pattern. Thanks for the intro! Thanks so much for helping me to test this pattern and for sharing it on your site. The print is just stunning and interesting to see it made in a knit too, for the cooler weather. I don’t think you can go past a simple, but well designed, shift. I was really pleased to get this pattern. Both of these look great. The first is very elegant and the second really cute. I like the hand stitched neckline. This is the dress I was telling you about http://www.meggipeg.com/2014/03/making-my-second-elegant-escape.html. The cardi is a perfect match! Your dress is divine. I agree with you, the slightly irregular hand stitching gives it a bespoke look. Love the different versions Sue! My machine is refusing to see knits at the moment so I may need to start trying out your beautiful hand stitching too. Oh no, why isn’t your machine liking knits? Have you tried a different needle? I’m slowly working through all the options, tension, needles, thread…no obvious answer yet but it’s frustrating as it used to breeze through knits. Love the colours on that fabric. Beautiful dress! Lovely shift dress. The fabric in your first one is just gorgeous. I can see this being a favourite in the summer. A useful pattern, and two great dresses for the wardrobe. Enjoy wearing them. Great dresses, both of them. I love how you changed the style by choosing a diffenrent fabric and adding pockets and hand stiching. Great shift dress and the coloured one will be worn out by summer. Interesting to see the dress as a pinafore for winter working just as well and your stitching adds a lovely touch.